Open daily 8:30 a.m. to 8:00 p.m.
Open daily 10:00 a.m. to 8:00 p.m.
One of the last areas of Japan to be colonised, it once was the domain of the “Ainu", an indigenous tribe with a distinct culture, whose history is on display in one of the city’s museums today. 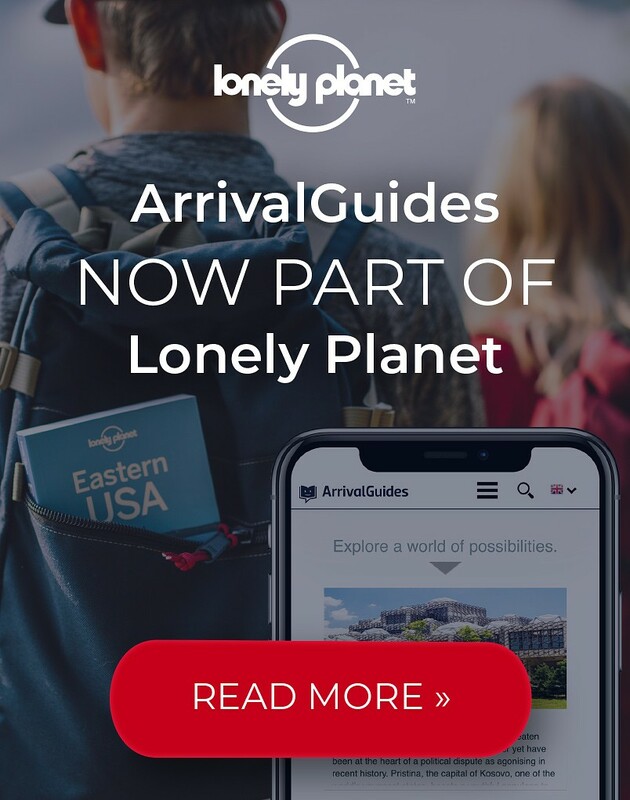 Adorned by parks and forests, complete with wildlife, it is a colourful, progressive, and energetic city that attracts the adventurous traveller. 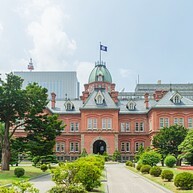 The legacy of Sapporo's vivid past is perceivable through various historical buildings. 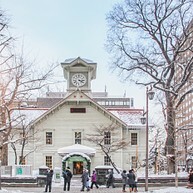 Historic landmarks include the former Hokkaidō government office building, the Sapporo Clock Tower, the Hokkaidō Shrine and the Sapporo TV Tower. Having hosted the 1972 Winter Olympics and as venue for the Sapporo Snow Festival, the city is also famous for winter sports. However, food and arts lovers will enjoy themselves here as well. 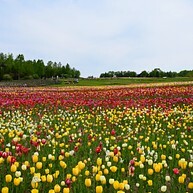 Sapporo Brewery and Shiroi Koibito Park, the Sapporo Symphony Orchestra, and Sapporo Artpark are popular sights, too. 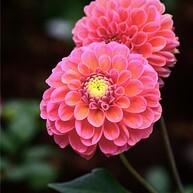 Visit the botanical gardens on the outskirts of the city. There are plenty of pleasant walking trails and lawns, inviting you to take a break. The area includes a small Ainu museum, a greenhouse and an alpine garden. 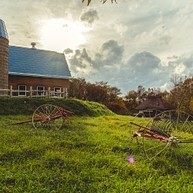 The Historical Village of Hokkaido has an outdoor reconstruction of Hokkaido life from the mid 19th Century. It shows 60 different types of buildings from this century and shows a town, fishing village, farm village and a mountain village. This clock tower is a lasting reminder of Sapporo's comparatively recent past. 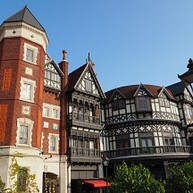 The wooden building is of American design and one of the few remaining Western-style buildings. It is a witness of the help Sapporo received from the American government in the 1870's when the city was first developed. This red brick building with its characteristic octagonal dome is beautifully lit after dark. It has been destroyed several times over the years, and restored time and again to its former glory. The building is today listed as one of the National Important Cultural Property, and a symbol of the city itself. The Maruyama Zoo covers a vast area and has an amazing variety of animals and birds, around 200 different species. It is a great place to take children, and visit (for example) the Tropical Animal House, the Bear House or the Kid's Zoo. Shiroi Koibito is a chocolate factory located in a picturesque fantasy land which is beautifully decorated. In the museum and on a factory tour you can see the process of confectionery production and taste some samples in the adjacent café. 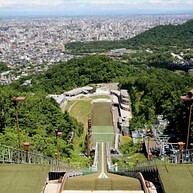 Mount Okura is the place to encounter an Olympic ski jump stadium and put yourself into athletes' shoes for a short while. You can take the ski lift to the top and admire the beautiful view of the mountains and city. Close to it is the Sapporo Winter Sports Museum with interactive games for young and old. With its 530 meters, Mt. 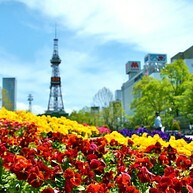 Moiwa is the highest landmark in Sapporo. 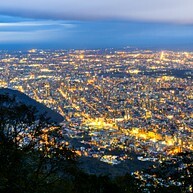 Take the ropeway up to the top and stay until the sun has set to enjoy the change in lighting. Be aware that it can be chilly in winter. 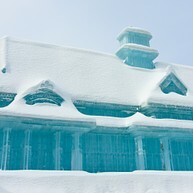 Taking place in February, the Sapporo Snow Festival is an impressive event. Huge snow sculptures, one more fascinating than the next, dot Odori Park; some require a staggering 500 trucks filled with snow to be built. With its fountain and hills forming many geometric shapes, Moerenuma Park is an attraction for all four seasons. In spring the trees look like a sea of cherry blossoms, in summer you can enjoy the refreshing fountain and wading pool facilities, in the fall the whole park is full of colourful leaves and in winter you can go cross-country skiing or sledding. Originally Odori Park was built to separate the city centre, namely the administrative district, from the residential and commercial district. Nowadays, it serves as an oasis directly in the city and is used as a venue for several festivals throughout the year. YOSAKOI Soran Festival, Beer Garden and the Summer Festival as well as the Snow Festival and the White Illumination all take place here. There are a lot of activities for both children and adults at Takino Suzaran Hillside Park. In the winter, you can go sledding and tubing or skiing on a gentle slope. In the summer, the park is full of pretty flowers and children can engage physically by bouncing on rubber, rolling huge red balls up the hills, exploring mazes and spider web climbing. Hokkaido Shrine is said to be the oldest temple in Japan. After a wonderful stroll through Murayama Park, you get to the Shrine. The entrance to the temple is very traditional with little stone pillars either side and traditional ceremonies are held regularly. 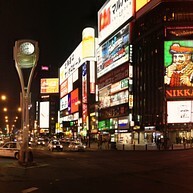 This bustling part of the city becomes alive at night. Restaurants, entertainment venues, bars and shops are lining the street and illuminate the whole area. When you are fairly new in this city, try to stay on main roads and avoid wandering into dark alleys.